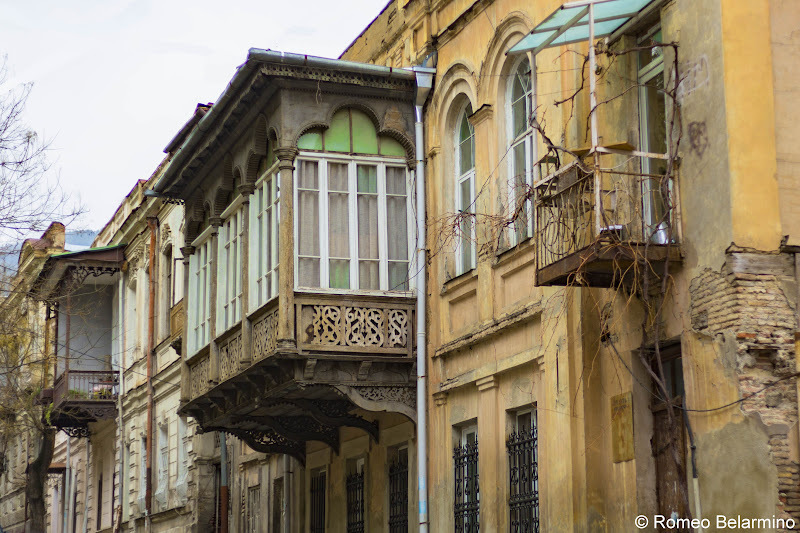 When I told the only other person I know who has traveled to Georgia that we were heading to this magnificent country, one of her many suggestions was to set aside time to walk through old Tbilisi to soak in the crumbling architecture and iconic Tbilisi balconies. So when our guide Anna offered to take us on an old Tbilisi walking tour to see the Art Nouveau architecture, we immediately said yes. We were surprised to learn that there was more for tourists to Tbilisi to see than just what is visible from the street. If we hadn’t had a guide, we would have never known that additional treasures were held inside the entryways of these Art Nouveau homes. (By the way, in case your knowledge of architectural styles is as minimal as mine, Art Nouveau is a style of architecture and design with linear and curving designs that was popular from the late 19th century until World War I.) As many of them are now apartment buildings, it is sometimes possible to pass into the entryways where a few still retain their ornately painted ceilings, intricate stairway metalwork, and even wall decorations as well. We first visited a curved tall building with interesting metallic work covering the windows on Rustaveli Avenue just southeast of Vano Sarajishvili Street. But that wasn’t our destination. We walked behind that building and found a secluded courtyard in the middle of the block with an aqua home presiding over the tiny remnant of a garden with a fountain and statues. 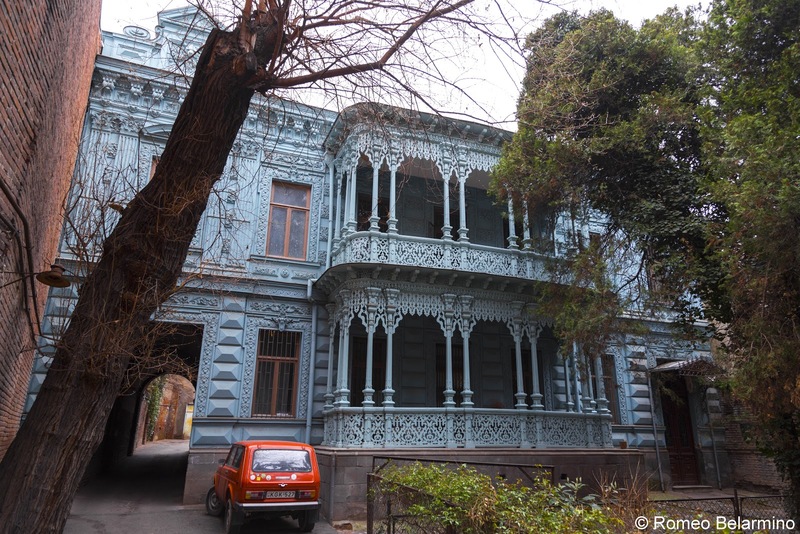 Most of the homes along Rustaveli Avenue were destroyed, but this one was saved because the son of the family acted as a doctor to Stalin and he asked for the home to be saved from destruction. 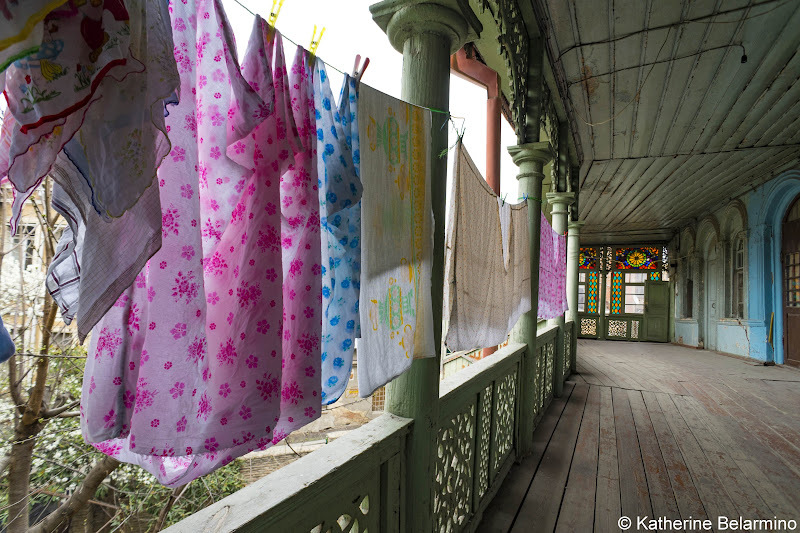 The same family still lives in the home today and it is an example of how these old homes can be restored to continue standing for another century. We continued passing through the block, walking through hidden courtyards surrounded by more modern and functional wood paneled balconies, some enclosed, some with clothes hanging from the line, until the block emptied out onto Alexander Griboedov Street. Heading southeast, we passed the Tbilisi State Academy of Arts and continued gazing at crumbling facades until we reached No. 14 Alexander Griboedov Street. This home was built by an Armenian gentleman with a successful fish business. The residence has two entries because he used the upstairs for his home and rented out the first level. While gawking at and taking pictures of the painted ceiling inside, something unprecedented occurred. Two women who live in the building came home and asked if we wanted to come inside their home and see what the rooms looked like inside! Anna said this never happens, even if Georgians are known for the boundless hospitality. 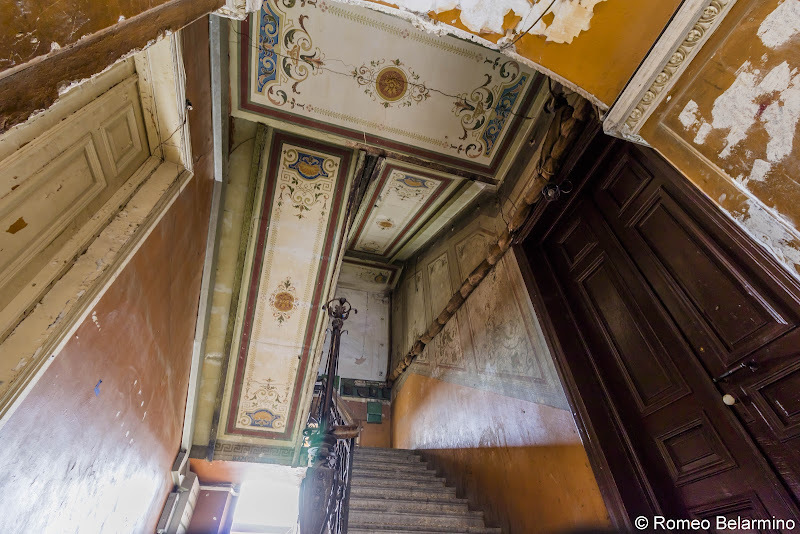 They might have thought we were foreign investors who might have the ability to help restore the building, or maybe they could just tell we were genuinely entranced by the building they call home. 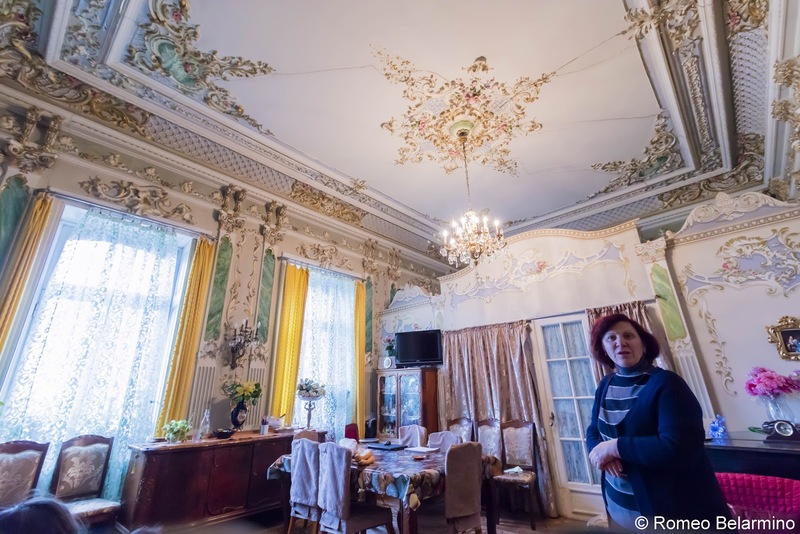 The lavish decoration, like carved wood trim painted with pastels and gold, which remains intact in their apartment is stunning. They told us their apartment was originally a guest room or entertaining room that held just one piano. Now the rooms of what used to be a residence for one family are separated into multiple apartments. Our next Art Nouveau entryway along our old Tbilisi walking tour was across the street at No. 15 Alexander Griboedov Street. 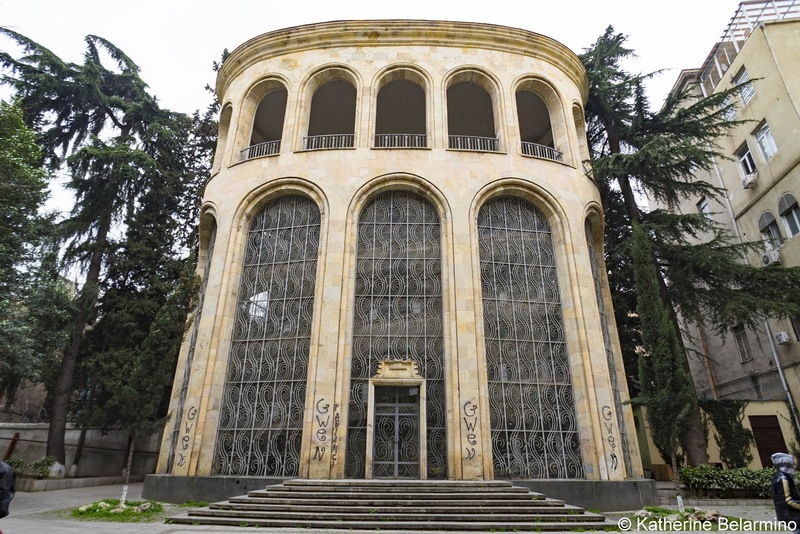 This was originally the home of an Armenian businessman who specialized in French wine. We diverted course and headed back out to the main thoroughfare of Tbilisi, Rustaveli Avenue. Between Lesia Ukrainka Street and Zakaria Chichinadze Street is an important Tbilisi institution, the Tbilisi Classic Gymnasium. The Tbilisi Classic Gymnasium is one of the oldest educational institutions of Georgia. Next door to the Tbilisi Classic Gymnasium is the old Parliament of Georgia. 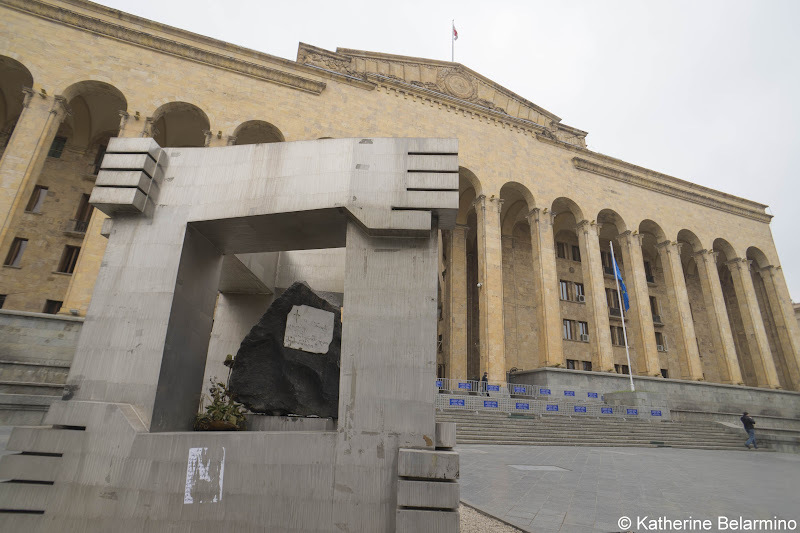 Georgia’s Parliament is now in Kutaisi, but the old Parliament building of Tbilisi still remains. 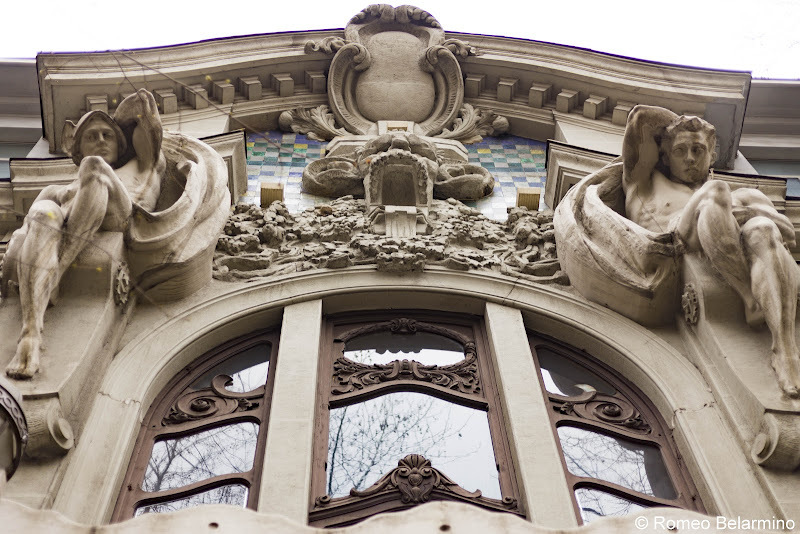 This building was built after the Art Nouveau period. In front of the Parliament building is an April 9 memorial, which commemorates the tragedy that occurred on the steps of Parliament on April 9, 1989. On that day, an anti-Soviet demonstration was held. When it was dispersed by the Soviet Army, 20 people were killed and hundreds of others were injured. Today April 9 is a national holiday, the Day of National Unity. 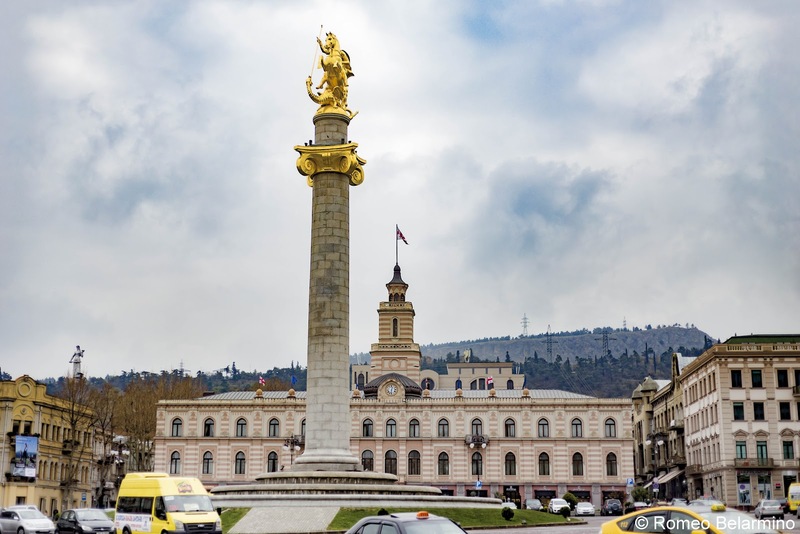 We continued down Rustaveli Avenue until we reached Freedom Square, a huge roundabout that circles the gleaming gold statue of St. George. From there we headed up Giorgi Leonidze Street, which used to be known as the warm street because both sides of the street were always sunny, no matter the time of day. This is no longer the case today, however. This is the beginning of the Sololaki District, which used to have a water system used to water the gardens. One hour of watering would cost one silver coin. In the middle of the 19th century, the Russians blocked the water channels and made the area a dry area. The land of the Sololaki District became very expensive and European-style buildings designed by the best Georgian, Russian, and Armenian architects were erected in this part of Tbilisi, mostly between 1880 and 1910. The Sololaki District has also been called little Paris because the streets are set up in a grid pattern rather than curving and winding every which way like in other parts of Tbilisi. Turn your eyes up at No. 3 Giorgi Leonidze Street, which used to house the Tbilisi Mutual Credit Society. An Armenian architect decorated the outside with Pluto and Mercury. A third story was added during Soviet times, but fortunately, this addition did not alter the original decorative appearance of the building. A few doors down we stepped into No. 8 Giorgi Leonidze Street. It just looks like a standard drug store from the outside. The previous occupant of this building needed to pay off his debt so entered the Russian army. For his service in the war with Turkey in 1878 he was given the building as a gift. He had always wanted to be a pharmacist, and his pharmacy became quite popular. Today his original pharmacy cabinets still stand, but now they are filled with Nestle. 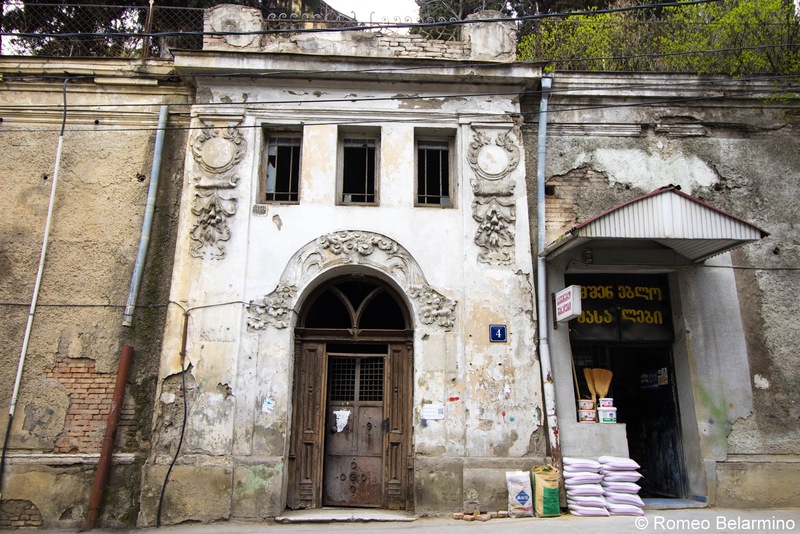 Across the street from the pharmacy is an unusual looking building, even for old Tbilisi. Through the oval entryway with its sunflower façade used to be a women’s glove maker shop. I don’t know the story behind No. 9 Geronti Kikodze Street, but I love the metalwork of the curving staircase. This is one of the brighter of the entryways of old Tbilisi. The walls have been painted solid colors, but the artfully painted ceiling still remains, though it is hanging on by a thread as it is cracked, with small sections looking like they might drop to the floor at any second. Heading deeper into the Sololaki District, we came to No. 58 Lado Asatiani Street. The outside of the building is quite well preserved, with its reddish-brown brick walls, arched doorway and windows, and curved balconies framed with iron railings. The wooden door is a work of art with lion heads scattered amongst the iron scrolls. As we walked through those doors we were greeted with the word “salve,” which means welcome in Latin, embedded in the cracked tile floor. This entryway is very colorful with green painted walls scratched and graffitied. 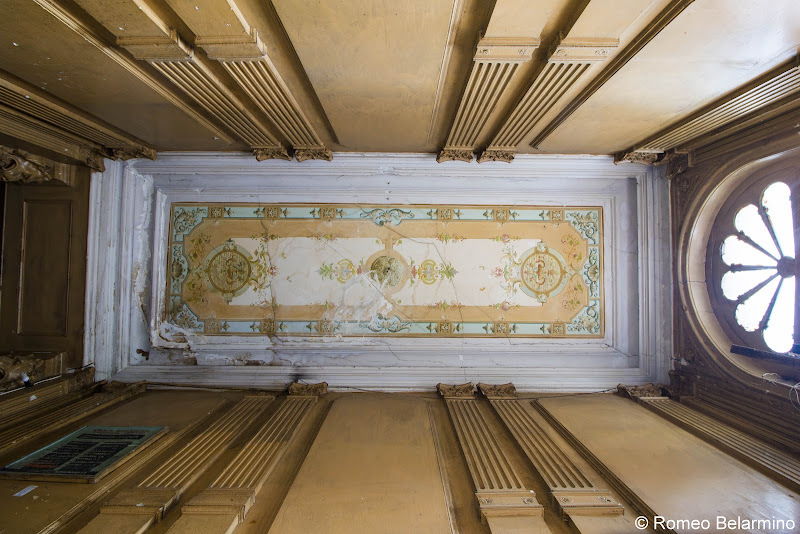 The peeling painted ceiling is a vibrant combination of coral, blue, yellow, and white with a mix of flowers, swans, urns, and devilish-looking figures with horns, wings, and tails, some playing trumpets. 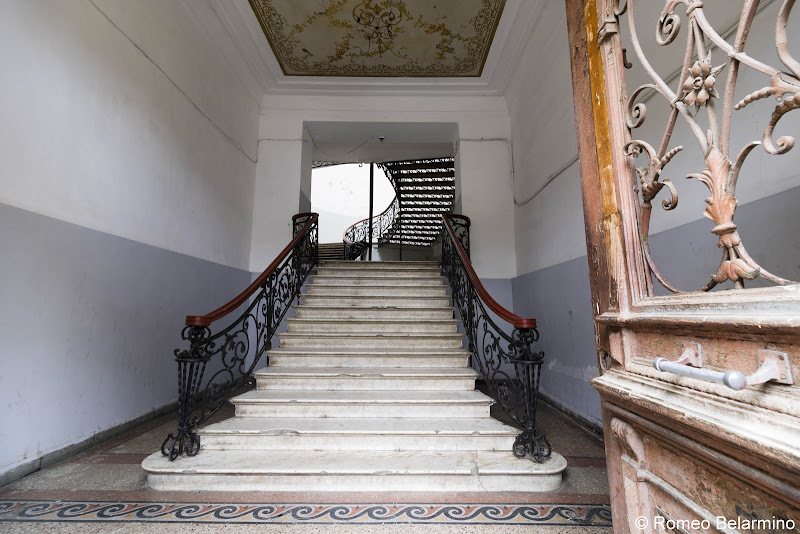 When we entered the doors of 4 Daniel Chonqadze Street, we were greeted by a dark entry with seemingly endless flights of stairs heading upwards. This house looks down at all the other houses around and has two entrances, one from the street above and one from the street below. 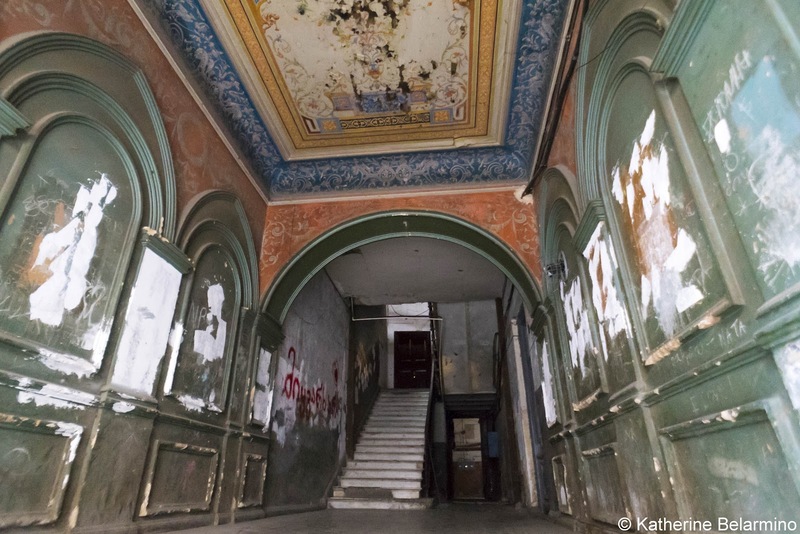 While the lower half is strictly graffitied white walls, as we ascended the stairs we encountered wall decorations and water damaged painted ceilings. We walked out a door at the top which led into a small hidden garden. The outside is different from the surrounding Tbilisi architecture as it has more of an English Tudor look. No. 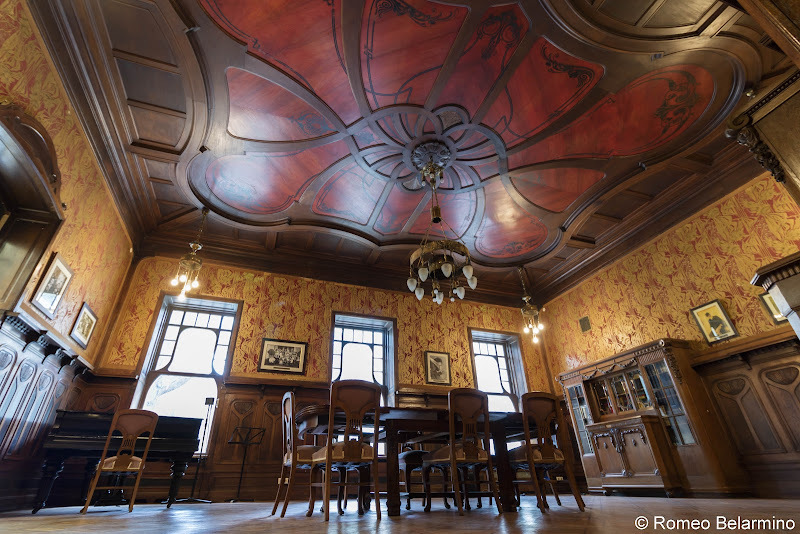 13 Ivane Machabeli Street is another Art Nouveau old Tbilisi home restored to its previous glory. The construction of the home was commissioned by David Sarajishvili, an awarded Georgian brandy producer, patron of the arts, and philanthropist, who lived in the residence from 1905 to 1911. The German architect Carl Zaar headed the construction along with Georgian architects Alexander Ozerov and Korneli Tatishev. 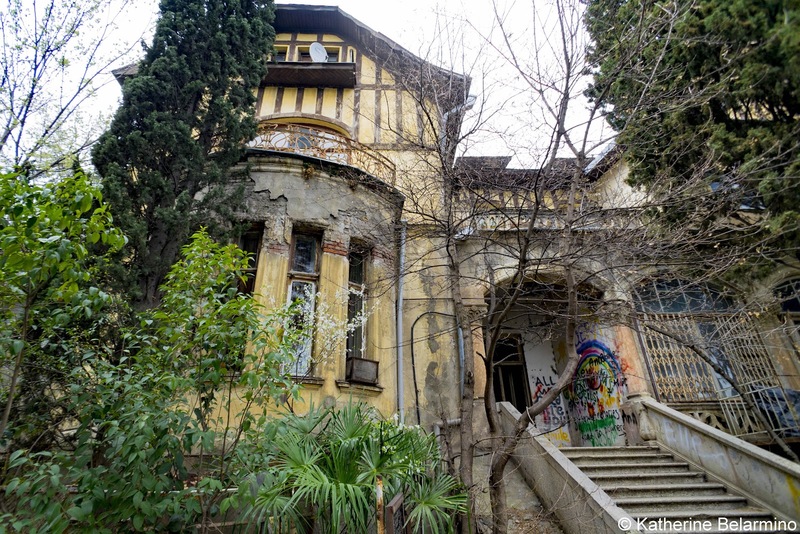 The home later changed hands to Akaki Khoshtaria, an entrepreneur, philanthropist, and famous public figure, who lived there from 1918 to 1921. Today it is the Writers’ House of Georgia, an open space for Georgian culture. When we visited they were still restoring the upstairs, but they let us walk through the ground floor rooms. The outside garden has gorgeous tiling and has a display of old photos showing how the rooms used to look. 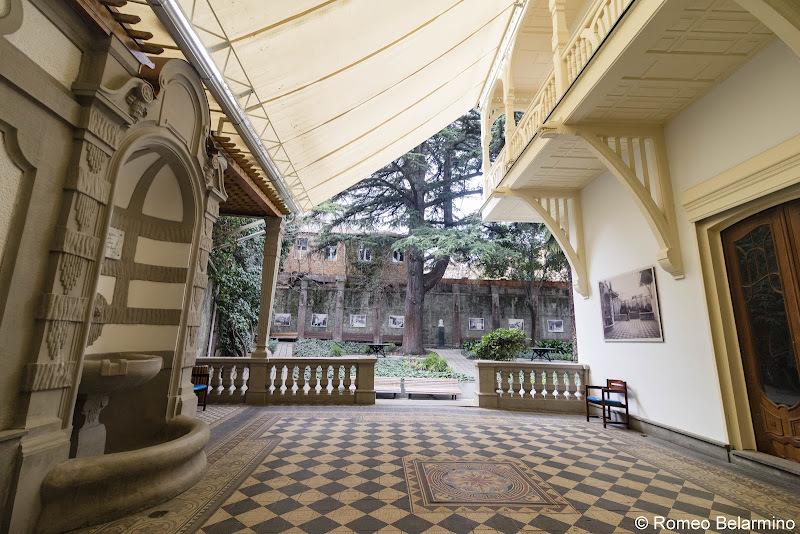 The garden is also an example of how the Tbilisians moved their signature balconies from the outside of their homes to the inner courtyards to conform to European design during the Art Nouveau period. On the even-numbered side of Galaktion Tabidze Street (I didn’t see a number, but it might be 20) we entered a dark portico unique from others we had entered because of the paintings on the walls. Unfortunately, they have seen better times. You can see the vibrant colors peeking through the blackness. In Soviet times, the paintings were covered with lacquer to preserve them from being destroyed, but unfortunately, this damaged the paintings. The paintings, painted by a Jewish artist, depict a different area in the world. The first, of course, is Russia, and others include Africa, America, Asia, and Europe. Most of the wall and ceiling paintings heading up the stairs have survived as well. Our final stop on our old Tbilisi architecture walking tour was about a block up from Jerusalimi Street at No. 4-6 Betlemi Street. 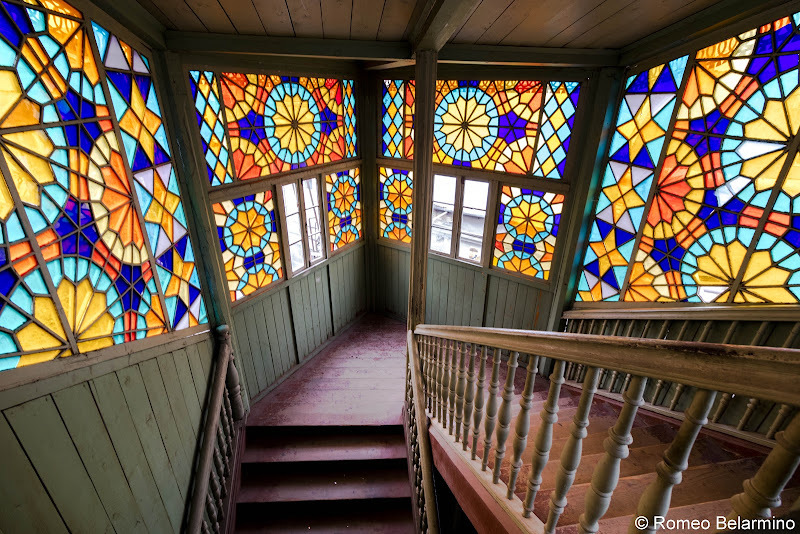 As you’ll notice from the street names, this is the Jewish Quarter of Old Tbilisi and this is a typical Jewish wooden house with an outdoor covered entrance with stained glass and an ornate wraparound balcony with lace-like latticework. 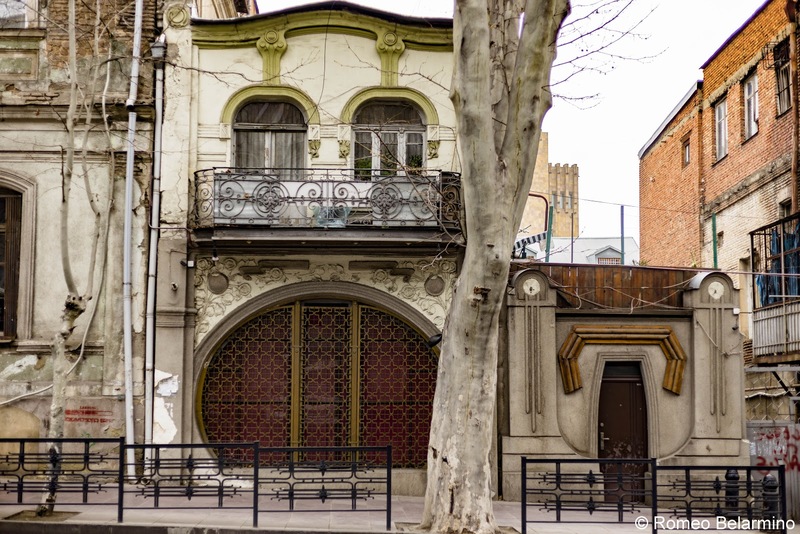 Many of the Art Nouveau buildings of old Tbilisi are protected as historical structures. However, they cannot be restored quickly enough. Some are on the verge of crumbling and some have already collapsed. 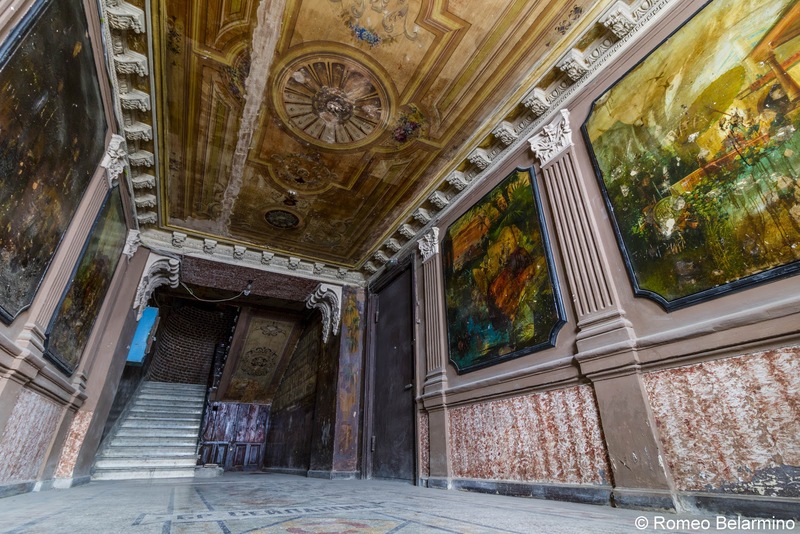 Hopefully these architectural treasures will be preserved and restored, but just in case, be sure to visit these ornate relics from the past while you can. 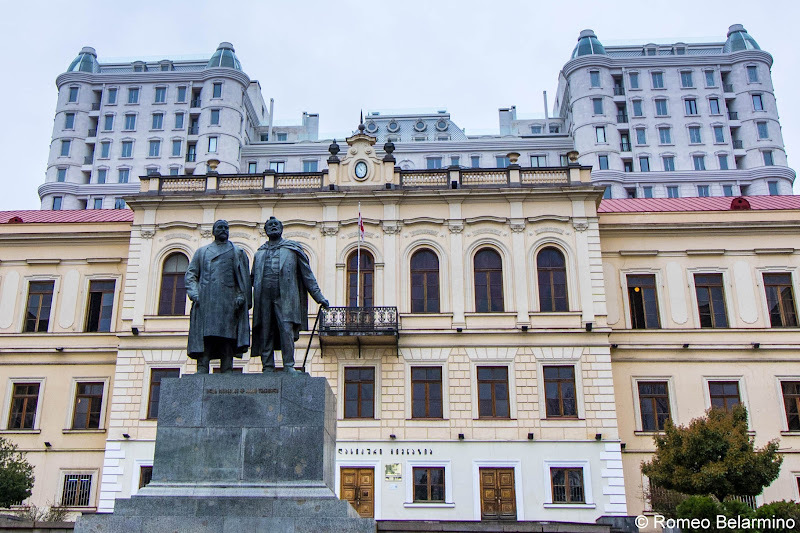 Of course, you can make your own walking tour of old Tbilisi and use this as a guide (hopefully my frantic note taking was enough to get you to the right places), or create your own tour and peek into the buildings that peak your interest. 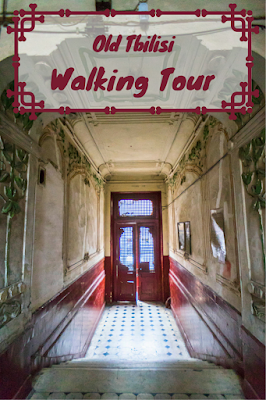 But if you want to be guided by an expert of old Tbilisi and its Art Nouveau architecture and learn the stories behind the buildings, you may want to hire a guide. You can try to book an old Tbilisi walking tour with our guide Anna Koripadze (anakoripadze@yahoo.com) or, if she is unavailable, she can suggest another guide for you. What I know for sure is that once you have a taste of what these old buildings hide you’ll peek into every open entry you pass with the hopes of finding a new treasure. Thank you to the Georgian National Tourism Administration for hosting our trip to Georgia and making this post possible. As always, all opinions are my own.